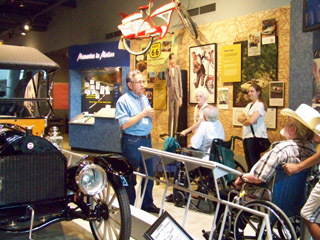 America On Wheels Museum welcomes groups! Group tours are available for groups of 10 or more people. 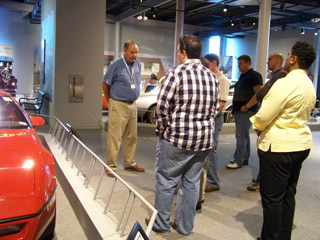 Groups can be led by a volunteer tour guide or groups can explore the museum on their own. If you would like a tour guide America On Wheels needs 2 weeks advance notice to schedule volunteer tour guides. During your trip to the musuem you can also enjoy a Museum Scavenger Hunt. 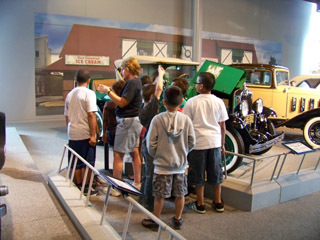 Scavenger Hunts are a fun way to enhance your road trip through the musuem. Visit the HubCap Cafe, a fully restored 1950s soda fountain within the museum. Enjoy the HubCap Cafe before or after your group tour! Additional menu items available during your visit in the HubCap Cafe at menu pricing. Free parking is available for all groups in the large museum parking lot. Tour bus parking is also available- arrangements should be made ahead of time. We request that you provide notice of cancellation at least two (2) business days prior to your scheduled tour. A $25.00 cancellation fee will be imposed if notified less than two (2) days prior. Please have your group arrive 15 minutes prior to your scheduled tour. All tours are approximately 1 1/2 hours in duration. Please feel free to explore the museum more after your tour is over. We believe that a picture is worth a thousand words photography is permitted in the museum. Our museum store offers a wide array of souvenirs and unique gifts to make your visit more memorable. The museum is wheelchair accessible and 2 wheelchairs are here for your use, first come, first serve. The museum has 2 coat closets located by the first and second floor restrooms you may use them to hang coats. 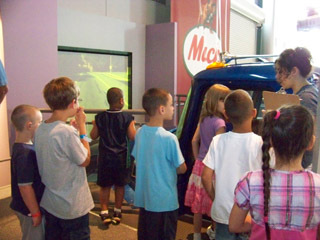 America On Wheels treasures the museum and ask that you look with your eyes and please do not touch displayed vehicles. They are historical objects and can be easily damaged. If taking a self-guided tour, America On Wheels volunteers will be stationed in different areas to answer any of your questions. Eating and drinking is allowed only in the lobby of the museum or in the HubCap Cafe. Food and drink are not allowed in the exhibit galleries. Please comply with instructions and requests from tour guides, volunteers and staff.